The Oxford Symposium on Food on Cookery continues to be the premier English conference on this topic, gathering academics, professional writers and amateurs from Britain, the USA, Australia and many other countries to discuss contributions on a single agreed topic.The 25th Oxford Symposium on Food & Cookery was on the subject of ‘Eggs’. 140 symposiasts came from all over the world, including most of the countries of Western and Central Europe, North and South America, the Middle East and Australia, as well as Southeast Asia, China and Japan. This is by far the widest geographical distribution the Symposium has ever achieved. Contributors to the volume include Bee Wilson, Pia Lim Castillo, Ken Albala, William Rubel, Rien Fertel, Fritz Blank, Phyllis Thompson Reid, Zona Spray Stark, Ursula Heinzelmann, Hervé This, Naomichi Ishige, Fuschia Dunlop, and Carolin Young. 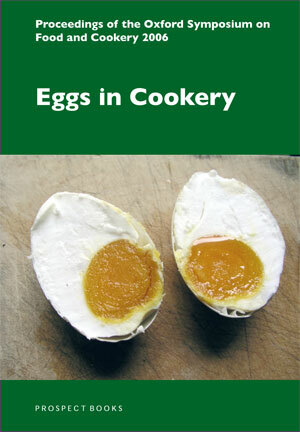 The subjects include the cultural and social significance of eggs; the use of egg whites in building Phillippine monasteries; the classification of egg cookery by classical French chefs; the mystique of the soufflé; ancient eggs in Chinese cookery; Arctic fish eggs; and molecular gastronomy and eggs.